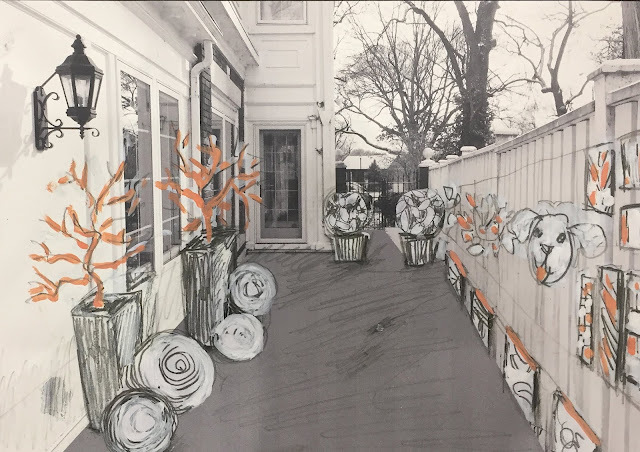 This week designer's proposals were due at the KC Symphony office for design spaces in the 2019 Symphony Designer Showhouse. 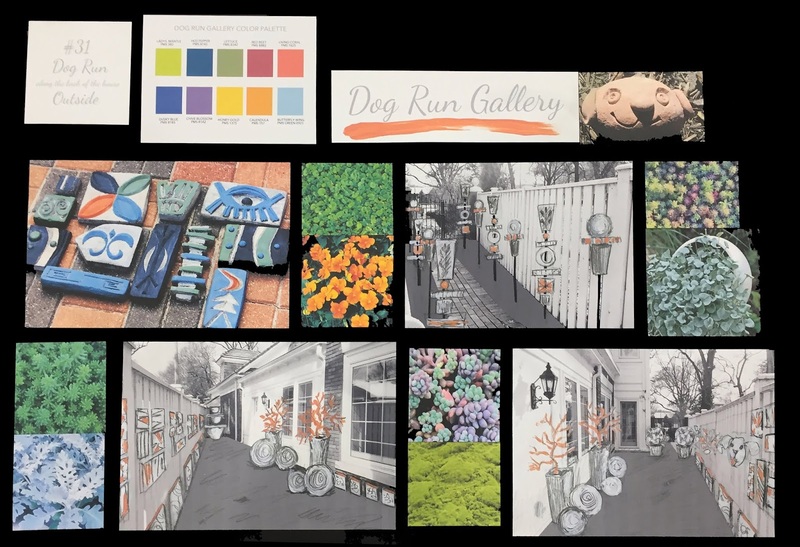 Our submission is called DOG RUN GALLERY. We treated the PROPOSED area as a gallery space featuring “outdoorable” artwork of concrete and hypertufa accented with Living Coral, Pantone’s 2019 Color of the Year. Living Coral energizes and enlivens with a softer edge, a life-affirming shade of orange with golden undertones. We aim to make this space comforting, appealing to both animals and humans, by adding a dash of kick that embodies playful expression. The space has been designed with most of the elements positioned up and out of the way to keep the space open for animal and human play. To keep the space low maintenance, live plants are kept to a minimum and are limited to those that will not harm animals or people nor take a great deal of watering. In fact, the featured botanicals are the two bunches of “Midwest coral”, (Hawthorne trees sprayed coral). Hypertufa spheres surround the base of these planters continuing the theme of circles and spheres. Other plants include dichondra grass, moss, Dusty Miller and colored sedums to fit the color palette. 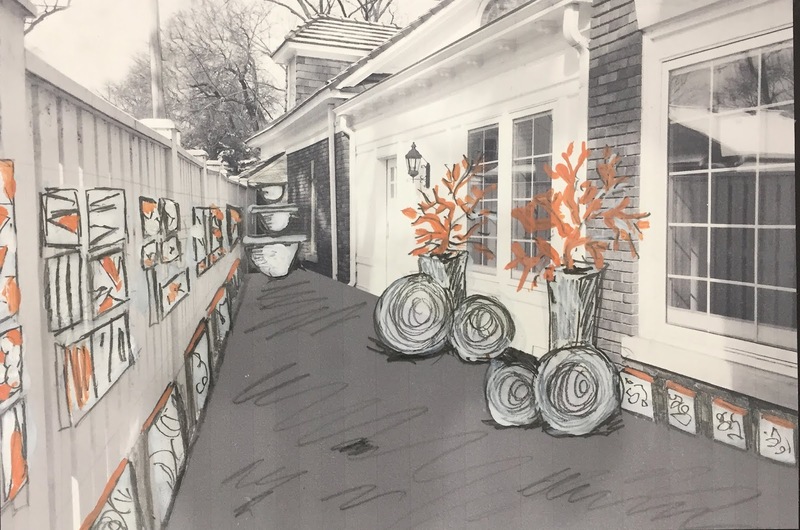 The stars of this Dog Run Gallery, aside from the dogs, will be the various sculptural pieces in concrete and hypertufa, celebrating circles and spheres. a popular trend in design for 2019. The pieces will be hung gallery-style along the length of the wooden fence. 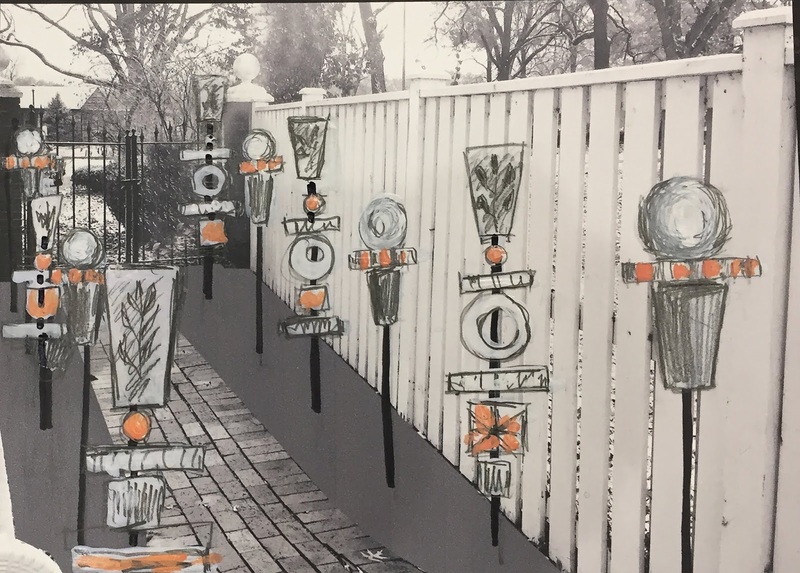 If you enter from the side entrance coming from the front lawn, you will encounter a gallery of sculptural stakes illuminated in the evening by solar lights also on stakes. At the back, to which all sight lines lead, is a multi-tiered planter filled with bright plants that will also be illuminated at night with solar lights. Dog Run Gallery will be an inviting space to play for the animals and their humans, morning, noon and night. 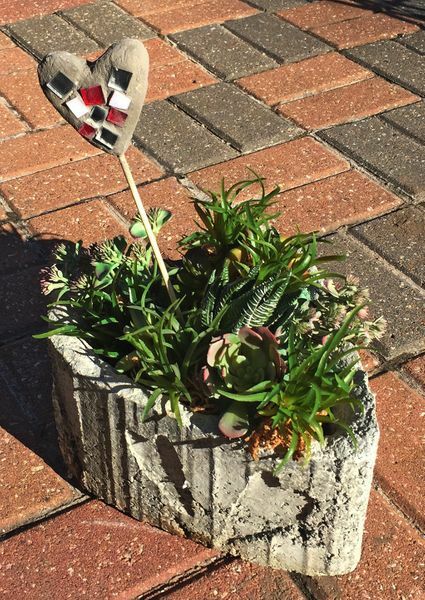 This coming Thursday evening, from 7:00-9:30, we will be making this heart-shaped planter with a mosaic heart accent pick. It is simple and fun and we'd love to have you joins us. The container makes a sweet cachepot that dresses up a grocery store plant for Valentine's Day. It also has a drainage hole so you can use it as a real planter in summer. Join potter Natalie Thomas as she demonstrates several interesting hand-building techniques with clay. You use these same techniques to make a set of charming heart-shaped bowls, including the Hand Print dish. 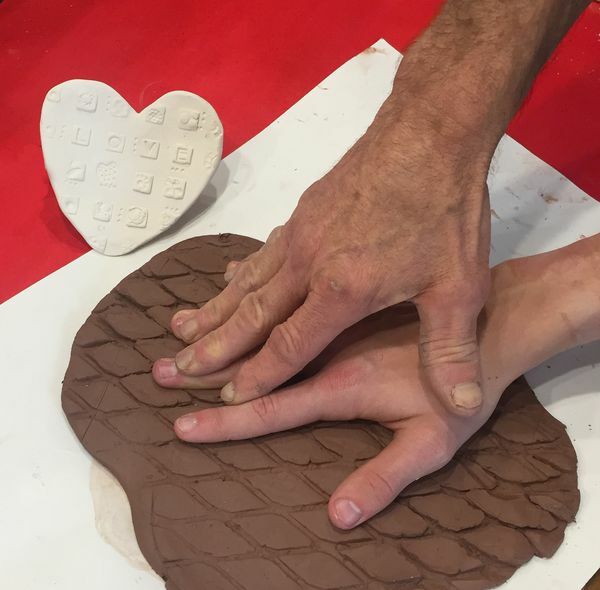 Bring a kid along and capture their handprint in clay that will be molded into a small bowl. Yep, they’ll always have their hand in the candy dish! Join us for this fun workshop. It's coming up in the middle of January and is the first of our Winter Wokshop line-up. Build a heart-shaped container mold from rigid foam and cast with hypertufa. Then you'll make a small mosaic heart pick to finish it off. This planter is perfect for pansies in springtime and petunias in summer. It is also a great container for succulents.